Minor burns are quite common, and it is usually hard to safe children from these household injuries. But when you say "burn", it means you're referring to that just more than burning sensation caused by an injury. These are basically a little severe skin injuries that sometimes cause cells to die. Most of the times, you can recover without any serious health implications, but it usually depends on how severe your injury is. However, it is important to seek immediate medical attention for serious burns. Here, you can learn how to treat a burn if that's not that so serious. First-degree burns: These are usually not that serious because they only hurt your outermost layer of skin. Marked by redness, you can treat your first-degree burns with a regular burn cream. Second-degree burns: These injuries damage the skin tissue (papillary dermis) under the first layer of your skin (epidermis). You may even notice blisters in the second-degree burn injuries, but they won't be larger than 3 inches in diameter. If they are larger, you will be better off looking for medical attention. Third-degree burns: These injuries damage all skin layers and usually affect a large proportion of your body. They can prove to be life threatening, so it is important to seek immediately medical help. Thermal burns: Use a blanked to cover flames or use water to smother them. If what you're wearing catches fire, you should not run and instead drop on the ground and start rolling to smother flames. Cold temperature burns: Immediately do something to warm the areas. You can even consider blowing warm air on smaller areas of your body, such as face, ears, nose, toes, and fingers. Electrical burns: Separate the person from the electrical source and immediately check him/her for a heartbeat. Notice if the person is breathing or not. In case you don't notice a heartbeat or signs of breathing, call 911 immediately. Chemical burns: Even the natural foods can cause skin irritation – chili peppers are a great example of it. When you experience one such burn, you need to identify the chemical first and contact the National Poison Control Hotline (1-800-222-1222) for information on how to treat a burn. 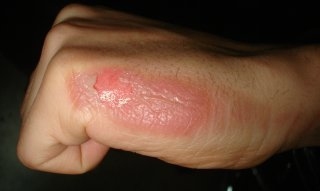 Liquid scald burns: Run cool water over your burn for 15 minutes or so. Never use ice water or it will cause cold temperature burns. You should also remove any bracelets, rings, watches, etc., immediately or they may cause tightness once the swelling occurs. The best thing to cover liquid scald burns is cling film, which is mainly because it's sterile and never sticks to your skin. Using a clear plastic bag is another alternative. Be sure to apply cling film in layers, not like a bandage. Using painkillers is essential to alleviate pain and swelling. You can give OTC pain reliever such as naproxen sodium (Aleve), ibuprofen (Motrin IB, Advil) or acetaminophen (Tylenol). While you can treat small, mild burns using a cream for burns or taking other measures, you will have to go see your doctor if the pain persists. A first-degree burn should go away in no more than six days, and a second-degree burn shouldn't take longer than 3 weeks. If your condition isn't improving, you should see your doctor. If you see your burn becoming infected. If you haven't taken tetanus immunization. If you notice blisters occurring on your skin. Now that you know how to treat a burn, it is equally important to understand what you should never do when you come across this type of a skin injury. Never put ice directly on your burn or it may even cause cold temperature burns. Always stick with cold running water for relief. Avoid using oil, butter, toothpaste, flour, sauce, onions or other household substances for a burn. This may lead to an infection and make it difficult for the doctor to treat the burn. Under no circumstances should you be putting any sticky, adhesive or fluffy dressing on your burn. Don't try to remove clothing if it sticks to the burn. Let your doctor do it for you. Don't put large burns in cold water or it may lead to hypothermia – it may even bring your blood pressure down and put you in state of shock. Keep all these things in mind and only try to take self-care measures if your injury is not that severe and visit your doctor if the steps you're taking don't seem to work. Server responsed at: 04/20/2019 6:37 p.m.